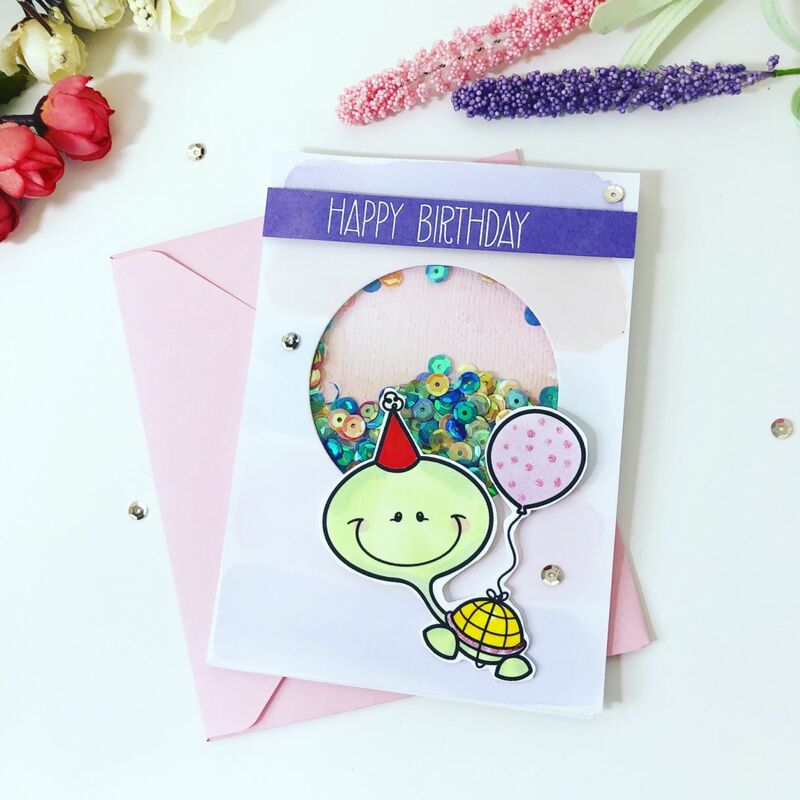 Good morning, I am going to show you how to make this super sweet shaker card today. You can use any image/stamp that you have at home. To make my card base I used a piece of White Card Super Smooth 300gsm and cut this down to make my base. I then scored and folded the card in half. I then used another piece of White Card Super Smooth 300gsm for my card front. You will then need to use some watercolour paints or inks to make some soft lines on the card front. I used my heat gun to speed up the drying then run this through my die cutting machine using a circle die. This will leave a circle in the middle of your card. You then need to turn this over and apply PVA glue around the edges. ( I use Anita’s PVA Tacky Glue 60ml) Once this is done cut down a piece of acetate and place onto the glue and wait for this to dry. While your acetate is drying you can make the backing which will show through your window of your circle. For this I used a piece of White Card Hopsack 255gsm and painted some watercolour stripes. Again I used my heat gun to quicken up the drying process. Once your acetate is dry you will need to add some foam tape all around the edges of the circle ( I use Stick it! 3D Foam Tape 9mm). You will then need to add some sequins and stick your other piece of watercolour card on the back. Your shaker part is now complete. I adhere this whole piece onto my card base. The next step is to choose your stamp and colour the image in. I also used some white embossing powder for my greeting which I heat embossed onto some Dark Violet Plain Card 240gsm and trimmed this and put the greeting at the top of my card. I then added the turtle image and used some Stick it! 3D Foam Tape 9mm to adhere this down. The next step is to place a few sequins onto the card to finish this off. I always use Anita’s PVA Tacky Glue 60ml for this. Once your card is complete I made an envelope using a piece of Pink Plain Card 290gsm, which is such a pretty colour. Your card and envelope is now complete. I hope you have fun making a shaker card!